Recruitment brand: What’s Your Purpose? The role of purpose in defining a recruitment company strategy. As a busy recruitment leader, focused on monthly sales figures, the process of creating a long-term strategy can be off-putting. There’s a lot of blue-sky, long-term thinking required to generate a bunch of stuff you haven’t got time to embed: vision, mission and values, etc. I’ve seen many brand strategy docs sit idly in drawers, long forgotten after the initial fanfare and launch. But with the total number of new recruitment agencies entering the market over the last two-and-a-half years—standing at over 12,000—recruiters now need to work harder than ever to position themselves as the brand of choice for candidates, clients, and their own consultants. This landscape suggests vanilla strategies, based on overly ambitious sales targets and the same old sales tactics, will fail to elevate brands in this crowded marketplace. Into this maelstrom, I’d like to introduce ‘purpose.’ It’s an idea that’s been growing in businesses in the United States (see HBR article) and the UK. In this post, I will propose that the idea is ripe for UK recruitment. It’s a concept designed to build and differentiate your brand and grow your business over the long term. The recent push to place purpose on the business agenda has gathered pace after the 2008 crash, led by Big Innovation Centre (BIC, an academic and corporate think-tank). BIC members include FTSE 100 companies and leading universities. Also, purpose is in demand from your current and future workforce; Gen Y and millennials are looking for meaning in their careers and work—not just a paycheck. Surely, recruitment brands can claim a stronger purpose than the makers of basic hygiene and cleaning products! Having a purpose isn’t some new-age branding puffery. BIC has estimated that because British companies are inadequately organised around a clear corporate purpose – one that unites all stakeholders through common goals and values – the potential cost to UK plc is £130bn a year! Purpose – why your company exists and how it fulfils the needs of people and society. If you start with purpose, it shapes everything that you do; it is the starting point. Eh, WTF?! I just want to make a profit. The astute, red-blooded capitalists would have noticed the absence of anything relating to profit. Surely, a business’ purpose is to make money, right? The promoters of purpose argue that a company driven by only profit cannot be trusted for the long-term because they are always seeking short-term profit. As you can see from Steve Job’s purpose statement above, by focusing on the value that you bring society, that society will reward you over the long haul. If you have a clear and compelling purpose, one that drives your company and product development, then you’ve more chance of people loving your product and brand, therefore creating a premium—and a profit. And boy, do they make a profit; their gross profit in 2016 is 38%. It looks like advancing humankind is a nice little earner too. Bringing it all back to recruitment, what, on a practical level, would a purpose-driven recruitment brand look like? And what would the benefits be? Faith – she is driven by excellence and wants to contribute to society. She wants her agency to be successful but believes building long-term success and value is only possible with a strong brand reputation. And in this age of transparency—driven by social media—she knows that if your brand’s going to be naked, it had better be buff. Max – he’s driven by profit; he wants the trophy house and wife and dreams of exiting his business for millions and retiring early in Marbella. This will be a short story because, sadly, it’s all too familiar. Both brand stories are based on niche IT recruitment, the most competitive recruitment sector. Sector: Software / FinTech & Retail – software developers, systems architects and testers. Brand motto, “Beautiful code deserves a great career.” Faith wants to provide software developers with the best careers possible. Consequently, her brand fights for their candidate’s recognition and reward. But she also knows that success should be shared, so her consultants (known as Partners), share in the success of the brand and deserve a reward for the effort they make in building careers. Faith knows that big ideas such as purpose only work when they are translated into everyday detail. Her recipe for embedding Career_Stack’s purpose. 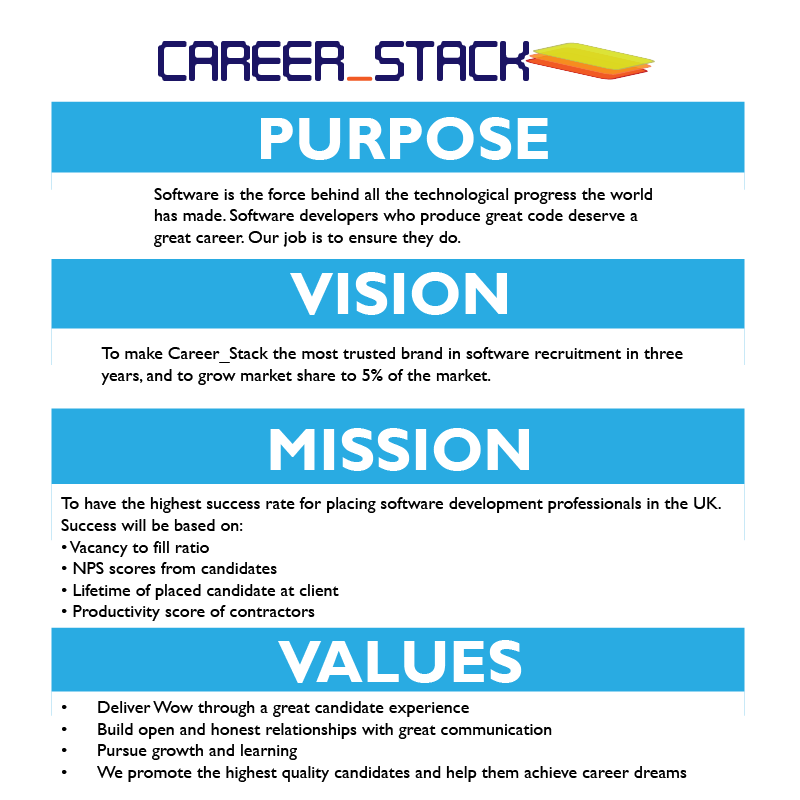 Faith’s business is called Career_Stack; the name is designed to appeal to techies and implies career progress. CSR – The company champions female coders and regularly runs workshops for women wanting to get into the software business. Also, the brand works with autistic healthcare charities to unearth potential software developers and give them the support and opportunities they need to succeed. Ethos: Training – All her partners are encouraged to learn all about software, and developers regularly explain the latest trends in the market at code and pizza evenings. Workshops and training are given around the brand values, communication, and, to mirror their audience, using data and systems effectively. Candidate acquisition – The good name they’ve built up within the software community allows them to join closed LinkedIn groups and generates lots of referrals. Gamification – One of the most successful candidate acquisition tools they’ve developed is ‘Jedi’s Challenge’, a website with a series of software problems and challenges. Players who complete a full series of games receive a score, career suggestions, and relevant live vacancies. The top scorers are automatically invited to speak to HR at Google. Thought Leadership – Career_Stack conducts significant research on the pay, benefits, working practices, and cultures that are effective for software teams. This research is shared via blogs, e-books, and white papers with the tech community. Consequently, when Partners give advice on remuneration and job specs, their clients listen. The Career_Stack website is full of resources for line managers and HR to help them find, train, and engage with their software staff. Their content generates many leads; these leads are nurtured to fit the client hiring cycle rather than Career_Stack’s monthly sales targets. Reward is based on a team level, but extra effort displayed in getting a candidate a better job or deal is rewarded individually. For example, placing candidates in a more senior role than they felt they were aiming for. Also, Career_Stack uses the ‘Net Promoter Scores’ not with clients but with placed candidates and all candidates that made it to the interview stage. The deep reservoir of knowledge about software talent is used to educate target accounts. Each quarter accounts are chosen for BD; each prospect is then targeted with relevant thought leadership and a proposal to improve their software team based on insights gleaned about that prospect. For example, if a target client is moving to an ‘agile’ software development, a report would be submitted detailing the best practice in transitioning the team and the skills required, along with recommended pay and reward structures for the new team. Potential clients are also offered access to experts within their network to get free advice on their challenges and problems. Of course, this free advice from tech experts is only possible because of the time and effort Career_Stack placed in their candidates. Contrast Career_Stack’s story with a reminder of a business based on short-term profit and too much greed. Max set up his company and named it ‘Olympus Exec,’ a pretentious name that reflects his greatness rather than his clients/candidates’ needs. The primary strategy for his business is great sales and, when needed, aggressive, coercive sales techniques and closing tricks. High fees are demanded from clients, which are not justified through any extra value provided—they just want a large margin. Staff are micro-managed through a myriad of irrelevant KPIs, and they are publicly chastised for not hitting them. All of the praise and rewards go to the ‘top billers’; everyone else is viewed as a drain on the company. Only basic training is provided to save money, with a sink or swim mentality applied to new starters. Business development is, basically, spamming clients with CVs. The brand and website sales message are stuffed with corporate jargon and baseless claims of superiority. They treat candidates as commodities, and only the easiest to place are given the time of day. Most conversations with them are focused on gaining leads and market intel. Candidate acquisition tactics are basic, with made-up jobs on job boards and waves of poorly targeted LinkedIn In-mails. Consequently, staff turnover is high. Candidate applications are low, and drop-outs are high. Repeat business is rare and client referrals non-existent. OK, this is an extreme example of a 1990s recruiter, the type that –hopefully– no longer exists. As you can see, if you put your purpose at the heart of your strategy, it can then shape every aspect of your business. I know what you’re thinking: How can all of that extra effort pay off and lead to profit? This level of value-add-effort within the community you recruit in will give you a strong brand reputation, stellar market presence, and immense trust. Candidates – high volume of referrals, candidate exclusivity, few candidate drop-outs, a high offer to acceptance rate, lower job board costs, access to the best talent. Clients – high volume of referrals, access to senior decision makers, strong repeat business, exclusivity on vacancies, access to PSLs. Staff – strong employer brand, motivated staff, lower salary and commission fees, strong retention rate, no rec-2rec fees, great employee referral scheme. I will be showcasing brands who’ve succeeded with a clear purpose. If your recruitment brand has a strategy with purpose please contact me.